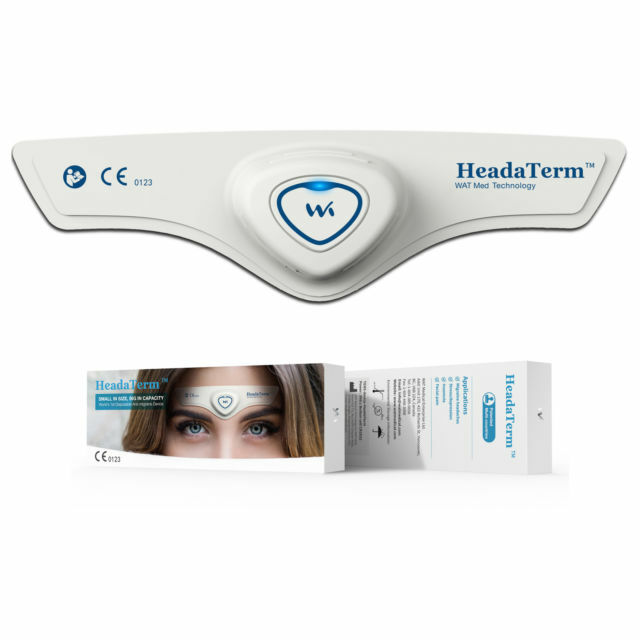 HeadaTerm is a proven, safe and effective drug-free device worn on users' foreheads to prevent and treats primary headaches, including migraine, tension headaches, and cluster headaches. Primary headaches are debilitating conditions that are extremely common. Drug treatments are the popular solutions to many patients, but just like with anti-nausea drugs, there are side effects that often turn people away. HeadaTerm offers a disposable and affordable drug-free treatment. Primary headaches, like migraine, are transmitted by the supraorbital nerve and the supratrochlear nerve. HeadaTerm uses none-invasive external Trigeminal Nerve Stimulation (eTNS) technology that introduces electric impulses from the user's forehead to act on these nerves and reduce the migraine signals transmitted. The device avoids any drug effects, making it appropriate for a wide range of users. Every device contains 21 rounds of standard therapies, each standard therapy lasts 20 minutes. The minimum operation span of each device is 7 hours. Once the device has started, the intensity of the treatment will increase to the strongest level within 5 minutes. During this period you can stop the increase and maintain the intensity by pressing the button once. The device will automatically shut down after 20 minutes of treatment. HeadaTerm is designed to be an affordable innovative technology that provides access to a drug-free treatment to everyone. Small in Size, Big in Capacity HeadaTerm is disposable, small and light, making it convenient not only to use at home or at the office, but also on trips and outdoor travelling. Read what others have to say about Provent. Or leave your own review.